Brindle boy Flying Minimus, known as Max, is now living in Centerville with Becky and Andy. 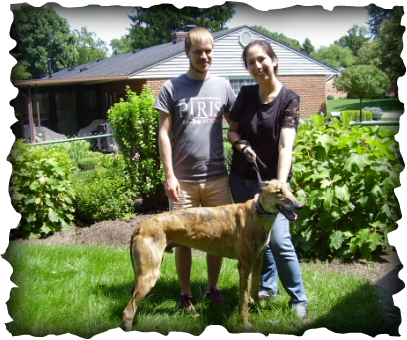 These two had thoroughly researched greyhounds and came to several Meet and Greets to be sure this was the right fit for them, so they were well prepared to welcome their new family member. Max is a Velcro boy and loves all the attention they give him. He enjoys meeting new people and going new places so he will make a great ambassador for the breed and for GAGC.